Ms. Camelia Bulat is the Executive Director of the CIPE-established Regional Center for Organization Management (RCOM) in Romania, which provides programs and services for business support organizations and other types of NGOs. Ms. Bulat possesses over fifteen years of experience in working with civil society groups (business associations, employers organizations, women representatives, advocacy watch dogs, chambers of commerce). 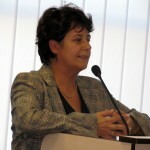 She has worked closely with civil society organizations throughout the Balkans, Moldova, Ukraine, and Belarus, strengthening their capacity in multiple key areas: advocating for better public policies, coalition building, creating programs and services tailored to members’ and local needs, and overall improvement of governance, management and operations. She holds an MBA from the Open University, in addition to a certificate in nonprofit organizations management from the U.S. Chamber of Commerce’s Institute for Organization Management, a professional diploma in management, and a BA in biochemistry.